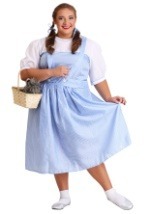 This deluxe witch plus size costume sets the standard for high quality Wizard of Oz costumes. The deluxe black dress has long sleeves and puffed shoulders for added effect. The high quality polyester dress also has button accents down the front and a tulle petticoat underneath for added shape. A wire-rimmed witch hat is also included. If you want to embody a classic witch this Halloween, then this is the costume for you!